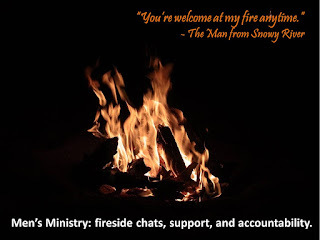 The Carpenter's Ministry Toolbox: MEN'S MINISTRY: "You're welcome at my fire anytime." 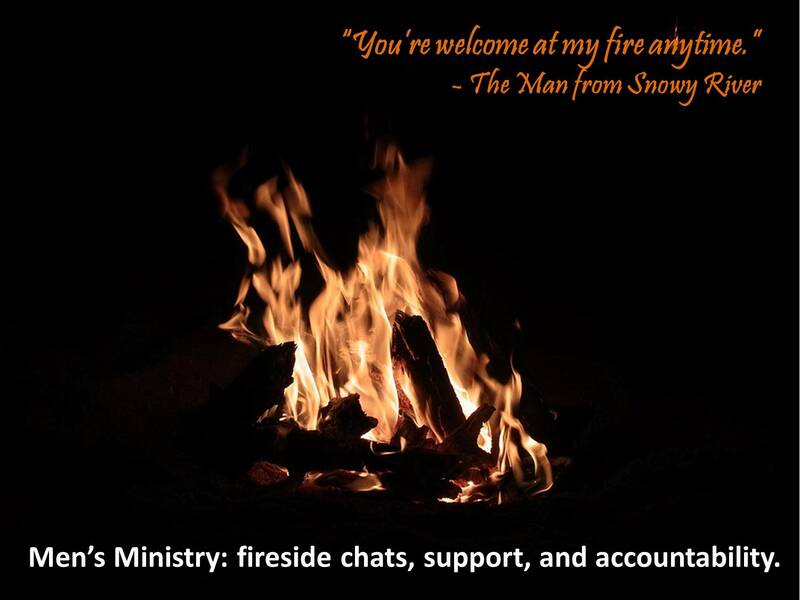 MEN'S MINISTRY: "You're welcome at my fire anytime." "You're welcome at my fire anytime." is a line from the movie, The Man From Snowy River. It's a cowboy phrase because being welcome at a campfire is a statement of friendship and trust. Everybody needs to connect. Women have been doing it for years in different ways in the church. Men have a little more trouble. After all, most don't quilt, they're usually not joining MOPS, and they don't really reach out or make friends in the same way women do. I posted before about a men's helping ministry, but this is something different. It's about filling them up and providing a safe place for them to get support and accountability with other men... around a fire. It's called a FIRESIDE CHAT and no women or children are welcome. For some reason sitting partially in the dark and smoking cigars around a fire is relaxing. I don't know, maybe it has something to do with the Holy Spirit appearing as fire on Pentecost in Acts 2. My husband has a weekly fireside chat in our backyard (if you have a fire pit at your church you could start one there too) where he invites his older sons (over 18), any men from our congregation, and any neighbor or man with which he comes in contact and is compelled to invite. Men are welcome to invite other friends, colleagues, family members, etc. as well. If the group gets too big, another group is started. It's a simple process and there is one firm rule: no alcohol. The goal is not to fix each other's problems, but to share the joys and burdens of life and encourage each other in Christ. Everything said at the fire stays at the fire. Warm-up time to shoot the breeze and punch each other in the shoulder. Remind each other of the confidentiality of the group. Anyone can pray or request prayer at any time during the fireside chat. Sometimes someone will drop a bomb and need the group to speak the truth in love and immediately pray. Remember that you are expected to have each other's back. Speak the truth IN LOVE. When men trust who they're talking to and open up, they receive an incredible amount of support and accountability and this becomes a powerfully uplifting part of their week. They grow closer to God, they become better leaders of their family, and better husbands and fathers. This is the kind of personal ministry that changes lives and helps men be strong, confident, faithful, God-loving men. If you'd like to know more about this program, please don't hesitate to contact me.